FREEMANSBURG, Pa. (June 15, 2017) - Vinny Nuzzolilli fired back in round two of the AMA Pro Hillclimb 2017 Series, taking the win in the Unlimited class at the Bushkill Valley Motorcycle Club’s hill at Freemansburg, Pa. John Koester, fresh off double wins in round one, took wins in both the Xtreme and 450 Pro (formerly Expert Singles) classes. Jay Sallstrom won the exhibition Verticross Class. Sean Van Assen rode first in the 450 Pro Class, cresting the hill in just under 20 seconds. Dan Storm shaved off a half-second, then Joseph Lowe set the new pace at 17.884 seconds. Sallstrom upped the ante with a 15.330. Nick Briggs moved into third with a 17.961. Koester topped them all with a 14.625 for the first place position at the half. After intermission, Koester waited to see if he’d be challenged. Many riders posted better times in the second half, but only Jockamo Baldina upset the order. He stopped the clock at 15.632 seconds to take over third position. Sallstrom’s first-half time held for second place. Koester’s one and only 450 Pro ride was good enough for the win. Nuzzolilli rode first in the Xtreme Class, but stopped at just 250 feet with a broken transmission. Justin Fowler crested in at 15.508 seconds, but was quickly bested by Alex Erikson with a 14.444. Sallstrom took over first place when he posted a 12.131. Phil Libhart topped the hill in 13.659, moving into second. Then Koester laid down a perfect ride with a 9.941-second E.T. to take over first place. Riding last in order, Cory Strickler wedged into third with a 13.084-second ride. As with the 450 Pro Class, Koester waited and watched through the second half to see if another, even faster ride was needed. He looked pretty secure with more than a two-second lead. Sallstrom came closest with a 10.865. However, it was still more than a second off Koester’s time, but enough to hold onto second. Libhart posted an 11.632-second time, taking over third place from Strickler. Koester chalked up one-and-done rides for wins in two classes. Dave Price was first over the top in the Unlimited Class, posting a 15.118 second time. Strickler stopped the clock at 12.846 for the lead. Baldina crested in at 13.825 just behind Strickler. Sallstrom moved into first with an 11.823 bumping Strickler and Baldina back one spot each. Unlimited Class riders dialed in their machines, refined their lines, and hill conditions improved as the second half of the Unlimited Class progressed. Strickler posted a 12.696 second ride. Koester stopped the clock at 11.097 to move into first. Sallstrom lopped off a half-second, taking over the lead at 10.569. Then Nuzzolilli, standing ninth at the half with a 450-foot distance on his first attempt, posted a blazing fast 10.478 seconds to take the win in the Unlimited Class. Leaving Sallstrom on his left and Koester to his right, second and third respectively. 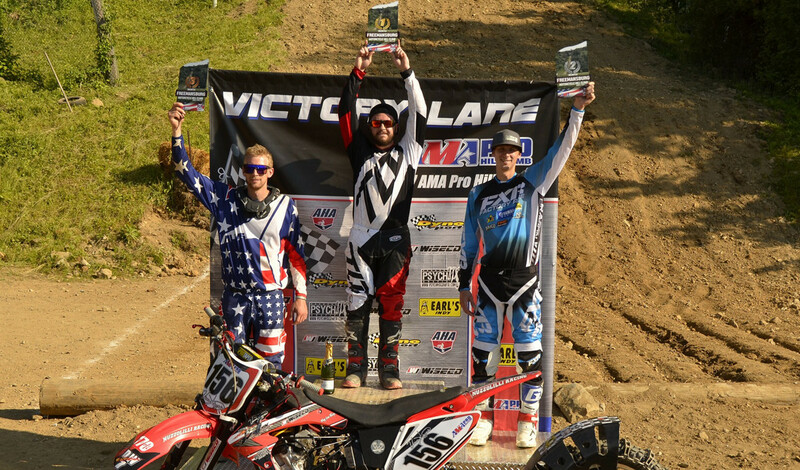 AMA Pro Hillclimbers race next on July 15 at Buffalo Valley, Tenn.
U/L: 1. Vinny Nuzzolilli (Hon); 2. Jay Sallstrom (Yam); 3. John Koester (Hon); 4. Alex Erikson (Hon); 5. Cory Strickler (Yam). Xtreme: 1. John Koester (Hon); 2. Jay Sallstrom (Yam); 3. Phil Libhart (Tri); 4. Cory Strickler (Yam); 5. Justin Fowler (Hon). 450 Pro: 1. John Koester (Hon); 2. Jay Sallstrom (Yam); 3. Jockamo Baldina (Yam); 4. Joseph Lowe (Kaw); 5. Phil Libhart (Yam). Verticross: 1. Jay Sallstrom (Yam); 2. John Koester (Hon); Sean Van Assen (Suz).